Netflix speeds surged for Comcast customers after the companies struck a direct-connection deal. Netflix's connection deal with Comcast is paying off. Streaming speeds for Comcast (CMCSA) users jumped nearly 50% last month after Netflix (NFLX) reluctantly agreed to pay up for a direct connection to Comcast's network. 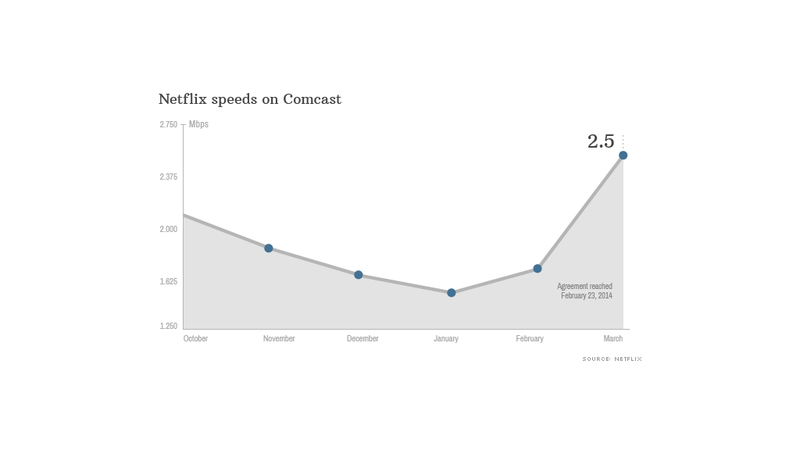 Netflix reported Monday that speeds for Comcast users averaged 2.5 megabits per second in March, up from 1.68 Mbps in February and 1.51 in January. Comcast's March figure was the fifth highest among the 17 U.S. Internet service providers ranked by Netflix, up from 14th back in January. Before February's connection agreement, Netflix had been delivering its traffic to Comcast through third parties, such as Cogent Communications (CCOI). Now, Netflix pays an undisclosed fee to feed Comcast its videos directly. Netflix has been engaged in similar talks with Verizon and others. Netflix called the figures "a great illustration of how performance can improve when ISPs work to connect directly to Netflix." The February agreement followed several months of declining Netflix speeds for Comcast users and a dispute between the two companies over how to resolve the issue. Comcast attributed the problem to network congestion and, given that Netflix accounts for around a third of data consumption online during peak hours, argued that the streaming video company should help foot the bill for delivery. Netflix accused Comcast and other big ISPs of shakedown tactics that sacrificed the interests of customers. 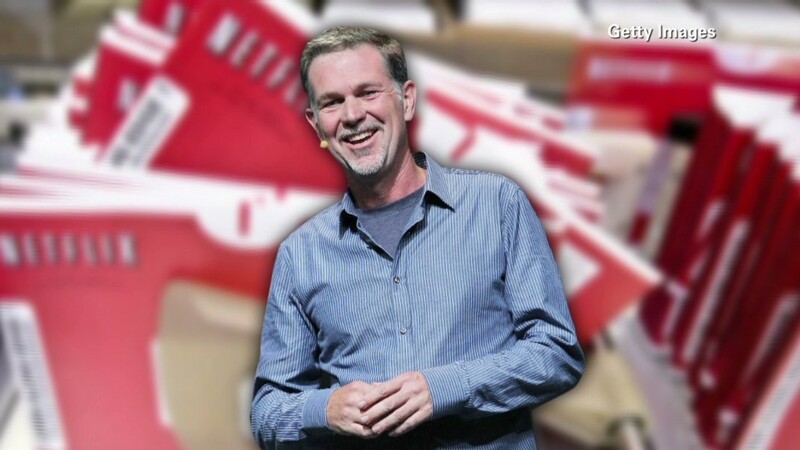 Netflix eventually agreed to pay, but the company wasn't happy about it. In a blog post last month, Netflix CEO Reed Hastings blasted Comcast and other large ISPs, saying the payment demands were an abuse of market power and a threat to net neutrality, the principle that ISPs should keep all online content equally accessible. Comcast responded that companies like Netflix "have always paid for their interconnection to the Internet," calling the deal an "amicable, market-based solution." AT&T (T) joined the fray as well, branding Hastings' argument "arrogant" and "self-righteous." The connection deal came up in a Senate hearing last week convened to discuss the pending merger of Comcast and Time Warner Cable (TWC), which would unite the country's two largest cable companies. Minnesota Sen. Al Franken cited the Netflix agreement as evidence that Comcast had "the power and the incentive to manipulate Internet traffic in its favor," an ability that he said would increase following the TWC merger. "I believe this deal will result in fewer choices, higher prices and even worse services for my constituents," Franken said.